NMJs play an important role in the functionality of Motor neurons. To meet these needs, Chipman et al. 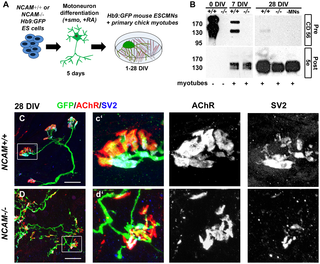 have created a clever co-culture system using Embryonic Stem Cell-derived Motor Neurons (ESCMNs) with primary myotubes. They also reported that NCAM-/- ESCMN/myofiber co-cultures exhibit the same phenotypes observed in NCAM-/- mice. This work give hopes to study MNDs in vitro by using motor neurons differentiated from induced Pluripotent Stem cells (iPS) derived from individuals with ALS and SMA. Want to know more about cell-based assays and co-culture systems? Stem cell studies & reprogramming. Ion channel analysis with Smartox venomous synthetic peptides (ex. Omega-AGATOXIN IVA a blocker of P/Q-type calcium channel (Cav2.1)). Drug discovery with pure and affordable active small molecules from FOCUS Biomolecules (ex. Nifedipine a L-type Ca channel blocker).